Endometriosis is a condition many women have during their childbearing years. It means that a type of tissue that lines your womb is also growing outside your womb. They usually grow on the ovaries, the fallopian tubes, and the outer wall of the womb, the intestines, or other organs in the belly. Endometriosis varies from woman to woman. Some women do not know that they have it until they go to see a doctor because they cannot get pregnant. Some have mild cramping that they think is normal for them. In other women, the pain and bleeding are so bad that they are not able to work or go to school. Treatment depends on the desired outcome: pain relief or fertility or both. The choice depends on a number of factors including the woman's symptoms, her age, whether fertility is a factor, and the severity of the disease. Watchful waiting is a good option for women with mild disease who don't want to bear children, and women approaching menopause. Hormonal treatment is based on the concept of reducing the cyclical hormonal stimulation to endometrial tissue. Pregnancy may alleviate symptoms, probably because it temporarily stops menstrual cycles. In some women, endometriosis symptoms do not return after they have given birth. Laparoscopic surgery /surgical removal of endometriosis and scar tissue can improve pain and chance for pregnancy. In severe cases, removing the uterus and ovaries (hysterectomy and oophorectomy) is an option. This surgery causes early menopause. It is reserved for women with no pregnancy plans who have had little relief with other treatments. Miss Akbar specializes in the holistic management of endometriosis especially when associated with subfertility / planning for a pregnancy and provides an individualized and focused care. Pelvic adhesions may involve any organ within the pelvis, such as the uterus, ovaries, fallopian tubes, or bladder, and usually occur after surgery. Pelvic inflammatory disease (PID) or endometriosis. Fallopian tube adhesions can lead to infertility and increased incidence of ectopic pregnancy in which a fetus develops outside the womb. Most adhesions are painless and do not cause complications. However, adhesions cause 60%-70% of small bowel obstructions in adults and are believed to contribute to the development of chronic pelvic pain. 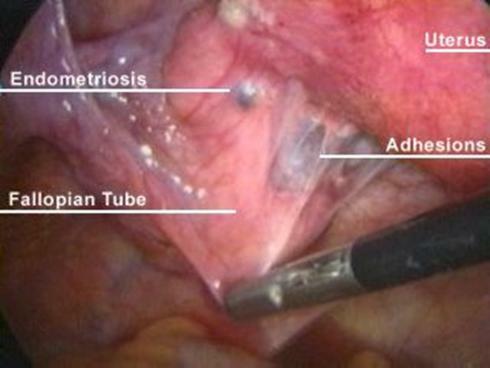 Adhesion removal can be achieved during laparoscopy as well as hysteroscopy. During laparoscopy and hysteroscopy most adhesions are divided easily and the organs are freed and restore the normal anatomy, this helps to improve fertility and chronic pelvic pain symptoms. To read more about laparoscopy click here.